NAIROBI, Kenya (CNN) -- Kenya needs $230 million over the next six months to feed millions affected by drought, the United Nations said in a new report. 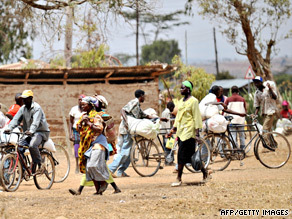 Farmers carry food handouts from the World Food Programme at a distribution spot near Nanyuki. The three-year failure of annual rains has reduced crop output, the main source of food for the country of 37 million. The drought has also affected water production and prompted power rationing in the east African nation. Kenya gets most of its energy from hydro-generation. About 3.8 million Kenyans need emergency food aid, and conditions are expected to deteriorate in the next few months, the United Nations World Food Programme said Wednesday. The rate among children under 5 suffering malnutrition has gone from 15 to 20 percent in some cases, the report said. "People are already going hungry, malnutrition is preying on more and more young children, cattle are dying -- we face a huge challenge and are urging the international community to provide us with the resources we need to get the job done," said Burkard Oberle, Kenya director of the World Food Programme. The organization said it is helping about 2.6 million people in Kenya affected by drought while the government is supporting 1.2 million more until the end of October. "In order to feed all 3.8 million people for the next six months, WFP and the Kenyan government will require strong support from donors in the weeks ahead," the report said. More than 17 million people across the Horn of Africa need help from the United Nations, which is battling funding shortfalls. Some of the most dire nations include Somalia and Uganda, which need $164 million and $96 million respectively.